The Sheriff’s Meadow Foundation just released its new Trail MV app for iPhone (Android coming soon), and this is a pretty big deal. 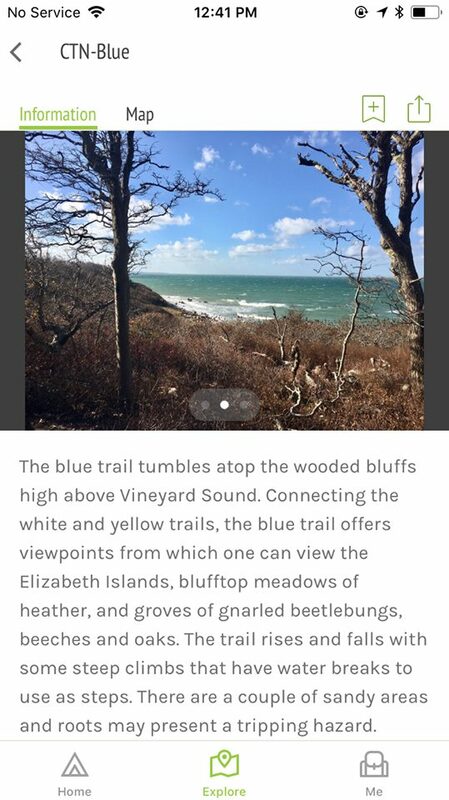 The Trail MV app provides you maps and up to date information on all the main public trails on Martha’s Vineyard. I will say this, it’s much better than Google for our trail system. I love Google, but sometimes its off a bit on the Island, but Trail MV is not. This app is two years in the making. Sheriff’s Meadow raised the funds and went through the process soup-to-nuts, on creating something that will change how we use our trails forever. 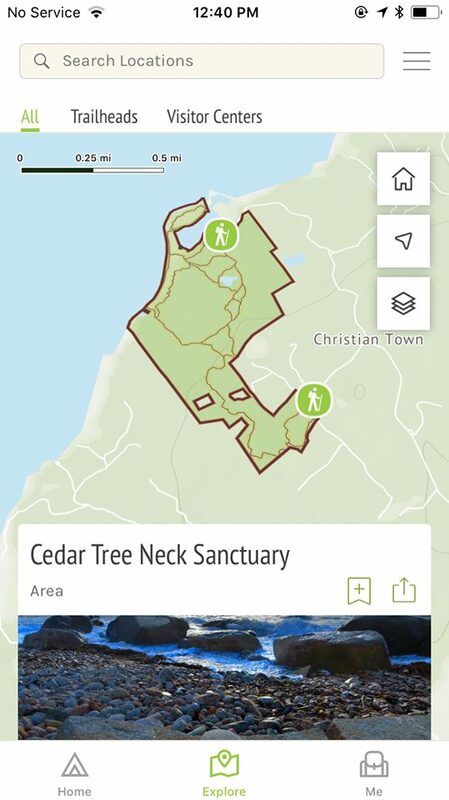 In one handy dandy little icon, you can find out information on trails from Sheriff’s Meadow, Felix Neck, the MV Land Bank, The Trustees and towns. A collaborative effort of epic proportions. Imagine, each trail had to be walked and mapped with exact GPS coordinates. So much data to be collected and processed for this Island app. There are over 100 properties that Trails MV covers, which means a lot more trails, since many properties have more that one trail. When you’re out walking/hiking, you’ll notice that the Sheriff’s Meadow properties have more visible trail markers and maps added recently — a byproduct of the app research. The Trails MV app helps hikers from the novice to the most experienced have more confidence in their exploration. The Island has so much to offer regarding outdoor experiences and this app really helps people discover how to take advantage of our Island’s natural beauty. Trails MV helps guide people to trails that would work best for an individual’s goal. We all hike and explore nature for different reasons. For some it’s to exercise, for some it’s to be closer to nature, for some it’s a way to mediate, but no matter the reason, this is one useful app. An added bonus is that the app is easy to update. Storm damage to a trail, trails closed? The Trails MV app can let you know in real time. Sheriff’s Meadow Executive Director Adam Moore, and board member Alan Rappaport were walking a trail one day together. The trail was not well marked, and it took a little back tracking for the two to find the path they wanted. 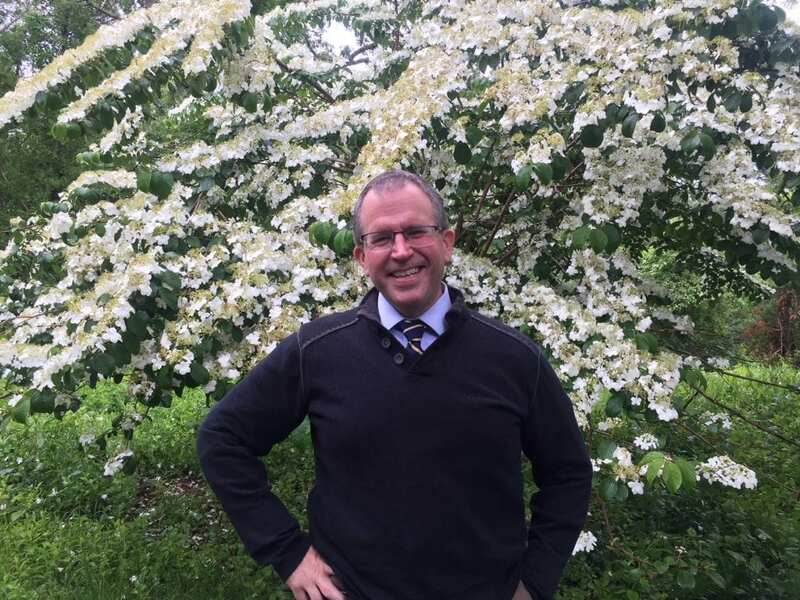 Alan saw an opportunity to help others not encounter the same experience and began the campaign to create Trails MV. Trails MV might not replace the Land Bank’s printed extensive map and a good ole compass, but the app definitely has a more mass appeal, especially for the younger generation. I know that this is going to be a great resource for me and my family, even after living here for years and walking so many trails. It’s super easy to install. It took only a short time. I just did it before writing this story. I went into the App Store on my iPhone, typed in TRAILSMV and voila. When downloading the free Trails MV app, be sure to be connected to a good WIFI source. Click Here to download TRAILSMV. Also, when using the Trails MV app on a hike, put your phone on airplane mode. The app will still be working, but will use a lot less battery. Nothing worse than running out of battery and missing that great pic! As mentioned, a number of organizations partnered with Sheriff’s Meadow for information for the app, but the towns were also very helpful. One of the biggest resources came from the Martha’s Vineyard Commission. Christine Seidel, the GIS coordinator (geographic information system), helped with all the topographic work – which was a lot! Kate Warner, the project manager, gathered all the data on the trails and wrote all the descriptions as well, a lengthy, detailed process, which yielded a wonderful collection of information on Island trails. As mentioned, there will be a version for the Android phone later this year. It is also a goal to add a tracking feature, and create a format for sharing pictures and connecting it to social media outlets. In the meantime – kudos to Sheriff’s Meadow Foundation for making Trails MV come to fruition. 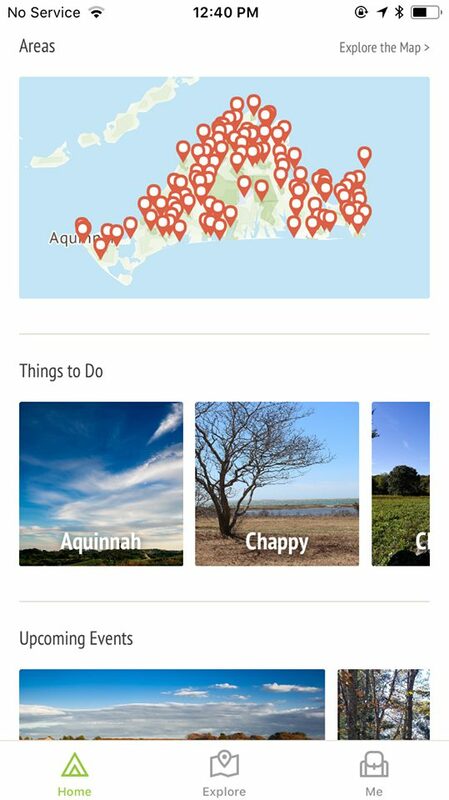 It’s a great app, one that is going to really help people see just how special Martha’s Vineyard is — every season of the year. The mission of Sheriff’s Meadow Foundation is to conserve the natural, beautiful, rural landscape and character of Martha’s Vineyard for present and future generations. Cedar Tree Neck, one of Sheriff’s Meadow Foundation’s properties is one of our Point B Vineyard Bucket List activities. We love it there! You can also learn more about Sheriff’s Meadow Foundation on Facebook or Instagram, and don’t forget to “Like” us on Facebook, and follow us on Twitter, Linked In, Google+, Pinterest and Youtube and Instagram. *Thank you Sheriff’s Meadow for the Trails MV screen shot pics!